Most people get into the martial arts simply to learn how to defend themselves. Indeed, self-defense is a common euphemism for traditional martial arts (as opposed to the competitive variety or MMA). Sports such as wrestling or boxing will draw a camp that have natural inclinations to do battle. The peculiarity of the martial arts is that its adherents are taught to walk away from trouble. But we all have met those who actually enjoy a good fight. As an ethnic group, the Irish are likened to having a propensity to fight. Donnybrook, Ireland was the site of a fair held for centuries until it was discontinued in 1855 due to massive brawling. Hence, a donnybrook came to be known as any group-like melee. The Irish-Americans that I know relish their fighting heritage, so I can't be accused of stereotyping. That's not my intention anyway. Students that enjoy kumite (sparring) tend to progress well with this activity, irrespective of any athletic deficiencies. They like to fight, ergo they experiment and research various methods, perhaps more than the next trainee. Technical ability is great, but it still takes guts (hara) to fight. A fine instructor once told me that fighting was 20 percent technique, 80 percent nerve. For some, getting up nerve is a major problem. For others it's a veritable party. If fighting really appeals to you, doesn't this make you a potential troublemaker? Isn't this antithetical to the spirit of budo? A bushi is a warrior, which implies that combat has some higher, loftier purpose than just someone who engages in contests. Choki Motobu would routinely field-test his fighting skills in his pursuit of Okinawan karate. Clearly this man liked to fight, but his reputation denied his admission to nearly every dojo on the island. As youths, Ed Parker and Bruce Lee actively sought out street matches to gauge their progress. Certainly, their contributions are undeniable. In John Stevens' Invincible Warrior there are a series of old photos in the back of the book that depict Morihei Ueshiba performing something called "Smiling Technique Variations". Sure enough, we see the master beaming as he throws one of his poor disciples clear across the room. The author didn't elaborate, but it reminds me of something Winston Churchill once said: "I like a man who grins when he fights." some good points you got there, dude. "If fighting really appeals to you, doesn't this make you a potential troublemaker? Isn't this antithetical to the spirit of budo?" Not necessarily. It took me a long time to become comfortable with kumite, but before I did I often seemed to play scenarios in my head where I took on attackers and glorified in the resulting melee. There is definitely a line where seeking fights to gauge your effectiveness turns into looking for someone to crush just for the purpose of crushing. However, it seems to me that practicing in a dojo would be a much safer way to do it. There one practices over and over so that the moves become ingrained within the body. At least this is the idea. But would your body know what to do if placed in a "real" situation? Who knows. My sensei always tells us that he still feels anxious when sparring, even when it's with his students, and he's quite an accomplished karateka. On the other hand, his sensei used to seek out GROUPS of men to fight with. I guess there will always be those who long to test their skills in a real-life situation and those that are happy practicing in the dojo. It doesn't mean that either aren't acting in the spirit of budo. Where they don't is when they go out looking to hurt someone intentionally. I agree yet I feel that it is not nerve but proper mental attitude which I guess covers "nerve". Choki Motobu would routinely field-test his fighting skills in his pursuit of Okinawan karate. Clearly this man liked to fight, but his reputation denied his admission to nearly every dojo on the island. Henry, my instructor on Okinawa, was a real scrapper. He loved a good fight. I also know that he fit the 2% personality type mentioned in Col Grossman's book on combat. 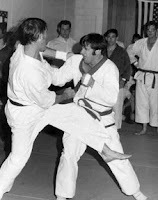 He routinely taught and kumite to keep his mind in sync with his urge to do combat. He also tested it frequently on the streets and in Viet Nam. As for me I guess I am lucky I got Henry as my instructor for I love a good scrap as well yet I don't feel I am in that to percentile yet I do feel I am a sheepdog and not the wolf or sheep. Interesting post. Personally I'm not one for fighting unless absolutely necessary. If you go around picking fights, no matter how skilled you are, you're going to end up losing eventually and what you lose could be your life. I just think people should train enough so they don't have to prove themselves in that way. It took me a long time to become comfortable with kumite, but before I did I often seemed to play scenarios in my head where I took on attackers and glorified in the resulting melee. Hmm, good idea. That's visualization. Fighting is largely mental, so it helps to prepare oneself ahead of time. On the other hand, his sensei used to seek out GROUPS of men to fight with. Whoa, that's taking it to a new level! Actually if you think about it, kata is the expression of facing multiple attackers - not that kata training will actually develop this skill. There's a story about Isshinryu's Don Bohan dispatching 6 guys in a bar one night. And I thought this stuff only happened in the movies! The psychology of killing is an interesting topic. I won't go into detail, but according to Grossman there was a marked difference in the combative mentality between the WW2 and Vietnam soldier. I guess it's possible to desensitize yourself to just about anything. I just think people should train enough so they don't have to prove themselves in that way. Kid: So, karate's fighting. You train to fight? Kid: [thinks] So I won't have to fight. Miyagi: Miyagi have hope for you! I'm into the "training so that I don't have to fight" mode. Yes, I will participate in sparring with all that I have, but it isn't the focus of my efforts. I'm more interested in the fight within me to surmount, and be victorious over my own self. I feel that this is a harder challenge than to be the winner of a sparring match. I think martial arts practice is many things besides fighting, but then again the ability to fight is a litmus test. If you can't fight, you're not doing something right. ...the ability to fight is a litmus test. If you can't fight, you're not doing something right. I agree that fighting ability is crucial. Everything's relative, though. All depends who you're fighting and under what circumstances. Fight only as a last resort. One of the main tenets of the martial arts. Real simple, yet not everyone gets it. what did he mean by that? I searched around for a while, but couldn't find any kind of interpretation. I'm a bit lost by this.. It made me search around sir Churchill. The British must be proud! ...what did he mean by that? Probably observing a man who grins as he fights somebody else; not necessarily the guy that he (Churchill) is actually fighting. Other than that I think the remark should be taken as is. Make sense? In boxing when a fighter smiles it usually means the last punch he took really hurt and he's just trying to cover it up. Who knows, maybe that's what Churchill meant. I usually smile because I know I've been caught off guard and that resolve to give my best has just hit me. I'll let you know when I get caught off guard. This is a great topic, John. I just linked to it over on riposte.org. To paraphrase a comment by one of the headmasters of one of my schools: Without the proper spirit in martial training, one can be led to ruin. Hear, hear. Love smiling when you fight. Celebrating the joy in combat keeps me well focused during sparring. Maintaining that joyful sense transforms me from a frustrated human punching bag into a much more able and confident fighter.